The Post Office bought or hired a few early bicycles or ‘velocipedes’, which cost £6 to £8 each, prior to 1880. However, their trials failed, mainly because it was difficult to find men fit enough to ride the bicycles. In 1880, two tricycle posts were used as an experiment in Coventry, because it was thought that it was less tiring to ride a tricycle. The Post Office paid the riders a weekly allowance of five shillings for the tricycles’ purchase and maintenance. In 1882, Edward Burstow, a Horsham architect, invented the ‘Centre Cycle’. Nicknamed the ‘Hen and Chickens’ it had a large central wheel and two small wheels at each end, and brackets above the small wheels supported a basket for mail at each end. In 1883, following the introduction of the parcel post, this type was used for the increasing loads in rural areas. It was apparently successful in Horsham, but less encouraging reports from other areas ended the experiment. Between 1883 and 1895, bicycles and tricycles were used on a trial basis for carrying post and telegram deliveries. By 1895, sixty-seven cycle posts had been established throughout the country, using bicycles and tricycles provided by their riders. The riders received a weekly allowance in return. In 1895, the number of cycles used led to the weekly allowance being fixed at four shillings per rider. Post Office bicycles were first officially introduced in 1896, when 100 were bought, largely to cope with the extension of the radius for the free delivery of telegrams from one to three miles. After this initial purchase, bicycles were specially made for the Post Office. However, this only lasted until 1904 when the Post Office specification was abandoned because many cycle manufacturers felt unable to produce the design which required special machinery. Manufacturers were therefore asked to produce quotes for bicycles of their own specifications, provided that they were suitable for Post Office work. As a result, from 1904 the Post Office used various designs, gaining experience about each type’s advantages and disadvantages. However, maintenance problems arose because separate stocks of parts were needed and the Post Office decided to return to a standard design. In 1929, the standard cycle was introduced, and annual purchases changed the whole fleet to this standard by about 1935. The 1929 design was used until 1992. Postal cycles had free-wheels and two brakes whereas telegraph cycles had a fixed wheel. The cycles, usually painted red, were required to carry loads weighing up to 50lbs, and had to last at least four years. A booklet entitled The Cycle Handbook was available at every office to assist Postmasters and others in the management of their cycles. The riders were responsible for keeping the cycles in good condition, and were supplied with a card entitled How to use and take care of Post Office Cycles. Repairs were carried out by local tradesmen with parts supplied by the Post Office. Post Office bicycles were ‘standardized’ in 1929, ie the Post Office laid down specifications to which the supplying manufacturers complied. This made it easier for the Post Office’s spare parts storage and supply. The specifications were updated over the years as components changed, but the basic style remained more or less the same. Postmen’s bicycles were red in colour, and those of an inspector were black. Obviously there were more postmen than inspectors, so this Post Office Inspector’s bicycle is much rarer. The ‘inspector’ who would have used this bicycle was usually the head postmaster. It was not fitted with a front rack when supplied to the Post Office; but often the head postmaster had to go out on the rounds to cover for a postman off sick, so a rack would be obtained from the Post Office stores and fitted on the bike. Like the rest of the bicycle, its original Dunlop saddle is in good condition, and it’s ready to ride. 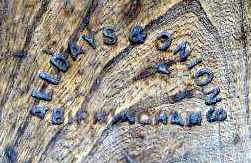 The company was founded by a family of craftsmen named Onions who manufactured bellows in their shed in the shadow of Dudley Castle. This was in 1650, during the reign of King James the First. By 1770 the company was trading under the name J C Onions and, having established a virtual monopoly in and around Birmingham, the company soon began manufacturing portable forges in addition to bellows. During the 19th century the company was appointed bellow makers to her Majesty’s ordinance and increased production, supplying forges and bellows to the new British colonies abroad. In 1885 a merger with a local rival manufacturer William Alldays saw the foundation of a new company, Alldays & Onions Ltd and advances in technology allowed the company to expand into new areas of production including water turbines, centrifugal fans, positive pressure blowers, pneumatic hammers, cupolas, furnaces, smithy equipment and a huge range of cycles and tricycles. 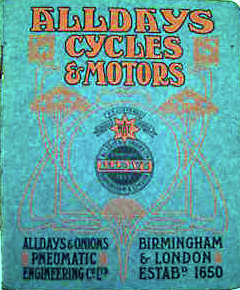 Cycles were made under the name ‘Alldays Cycles.’ They started making cars in Birmingham in 1898, and motorcycles in 1903 at their Great Western Works. 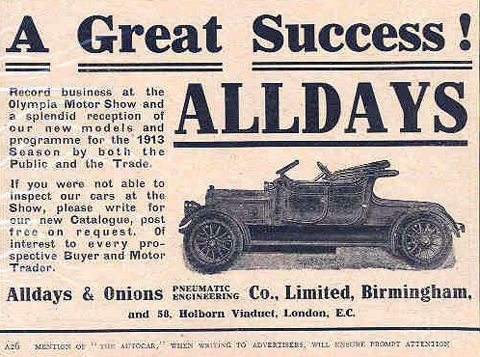 When WW1 ended the company produced the Enfield-Alldays series LC, but in due course vehicle production ceased and the company looked to different products for survival. Below you can see Alldays’ standard pattern tradesman’s bicycle, using their own chainwheel. Their military bicycle was similar. They used the standard GPO chainwheel when supplying the Post Office.